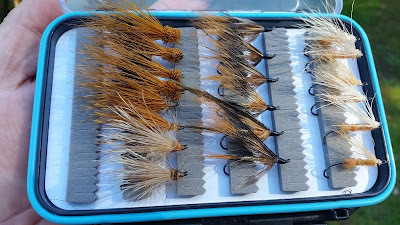 Fresh October flies for sea-run cutthroat trout and summer run steelhead. We have been getting an extended "Indian Summer" here, with some very mild, sunny days on the water. After weeks of blustery conditions, and several cancellations, I finally got to fish with Leland again, for a day on the beaches, chasing cutthroat trout. We tried a few new spots, covered some beautiful water, and had a great lunch break. Sadly, I did not get any pictures of Leland napping on the beaches this time. Leland got into some aggressive cutthroat after lunch, and he seemed to be surrounded by trout chasing his popper. That action lasted for over an hour, and it was a hoot to watch. 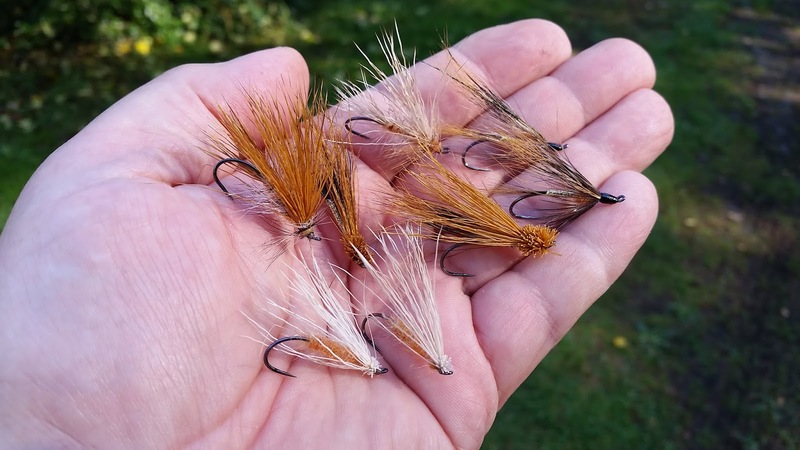 There's nothing quite like having wild trout attacking your fly, in shallow fast water. Coho season closed here last Sunday, after a seriously slow season on our beaches. Swinging a #6 trout fly, on a five weight rod, with a 4X tippett, I got a nasty slashing hit from a slab of a coho, that immediately cut off my fly, and headed south like a streak. That the fish was on the surface, made it all the more spectacular. And I didn't mind it a bit. We just take it as it comes. Variations on the October Caddis. All boxed up and ready to go. The Olympic Peninsula rivers have been getting some rain and much improved flows for the last few weeks or more. Each cycle of rain seems to be brief enough to allow for some good fishing as the river levels drop. This has been an ideal set-up for some great fall fishing. We have not gotten any great flooding events as of yet, so things are fairly stable. The saltchuck has been busy with feeding sea-runs, lots of bait around this fall, and some of the biggest fish of the year. This has always been my favorite time of year. The refreshing cool air, the subtle changes of the fall foliage, wood smoke in the air. And the fall harvest of so many good things. The changeable weather keeps things stirred up and changing in the waters too. I like fishing in the hours and days after a storm or high water event. This keeps the fish moving. And that can really help the fishing, as long as they aren't moving too darned much. These beautiful autumn days are not to be missed. I'll bring the lunch, with hot coffee or tea! Fly fishing for sea-run Cutthroat from a classic Swampscott Dory. For one angler. By appointment only. I am guiding fly fishers on the Olympic Peninsula beaches, rivers and streams. 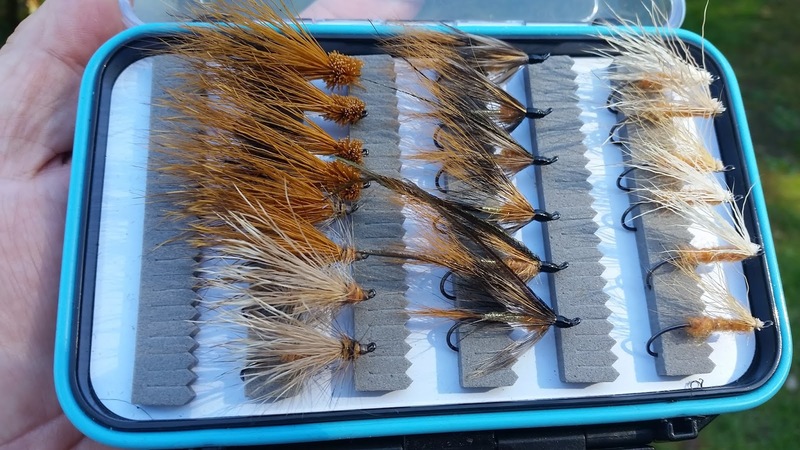 We walk and wade, fly fishing for sea-run Coastal Cutthroat trout in freshwater and saltwater, and in the rivers for Cutthroat trout and summer steelhead. This is strictly catch and release, traditional fly fishing only. Lunch, snacks, soft beverages, and use of some equipment is included. I also offer personalized and private fly fishing and fly casting instruction for beginners through advanced casters. I would be happy to help you plan your Olympic Peninsula fly fishing adventure, for all levels of ability. Public presentations, Naturalist Guide, rowboat picnics, tide pool and river trail day trips. Please call, write or email for booking details. Now booking through October and beyond. Please call or write for details.